When pollutants are trapped for a long time over a city, it is usually because of a temperature inversion above the city. This may result in accumulations that can reach lethal proportions, at least for the sick and elderly. Temperature inversions occur when air at some elevation in the troposphere ceases to decrease smoothly in temperature with increasing altitude as is normal near the surface of the earth (see later: Figure 3-20). At a temperature inversion, the air temperature increases with increasing altitude for a distance; at higher altitudes, the normal decrease in air temperature with increasing altitude begins again and continues up to the tropopause. The ways in which such temperature inversions can occur will be discussed at the end of this section. where CP is the heat capacity at constant pressure of the gas, and subscripts 1 and 2 refer to properties of the gas before and after expansion, respectively. Qualitatively, this expression shows that if the gas is expanding, that is, if P2 < P1, then T2 < T1 and the temperature of the gas will drop. This equation, together with the known decrease of pressure with height, allows calculation of the adiabatic lapse rate of dry air. This rate is a decrease of 1°C for each 100 m, or 5.5°F for each 1000 ft of altitude. The rising air cools faster than the temperature lapse rate of the environment, which involves a decrease of only 0.65°C for each 100 m or 3.5°F for each 1000 ft of elevation. Dry air will eventually rise to a height where temperature and, therefore, the density matches that of the surrounding air. If the rising air contains a lot of moisture that condenses as the air rises and becomes cooler, then heat is given off during this condensation and the air cools more slowly with height; that is, its temperature lapse rate is less than that of dry air. This moist air will therefore rise higher than dry air and will probably form clouds as it rises. These conclusions are illustrated in Figure 3-19 which shows what happens to heated dry air when the environment (the troposphere) is normal. The solid line shows the temperature of the lower atmosphere when the temperature of the surface of the earth is 24°C and there are no temperature inversions in the atmosphere. If the sun is shining, the surface of the earth absorbs heat and becomes warmer, heating the air just above it by conduction. The two broken lines in Figure 3-19 refer to two different "parcels" of air heated by the surface of the earth, to 25 and 26°C, respectively. Both parcels of air will begin to rise as just discussed; they rise with the temperature lapse rate of rising dry air. Since the temperatures of these two parcels of air are decreasing faster, 1°C per 100, than the temperature of the air through which they are rising, 0.65°C per 100 m, each parcel will eventually reach a height at which its temperature equals that of the air already present. Its pressure and density are then also equal to that of the surrounding atmosphere, and the parcel will stop rising. Figure 3-19 shows that the parcel that was heated to 25°C will rise to a height just below 300 m, while the parcel that was heated to 26°C by the surface of the earth will rise to a height just below 600 m. Hotter air rises to a higher altitude. FIGURE 3-19 The fate of dry air heated by the earth's surface when the temperature lapse rate of the environment is normal: height vs temperature of the environment (solid line) and of rising, heated dry air (broken lines). 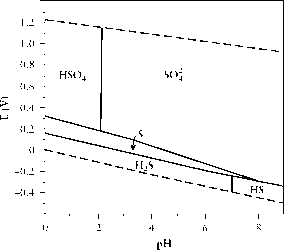 FIGURE 3-20 How a temperature inversion traps heated air and its associated pollutants: height vs temperature of the environment (solid line) and of rising, heated dry air (broken lines). shows the variation of atmospheric temperature with altitude is not linear; it has a region in which temperature increases with increasing altitude between approximately 400 and 600 m altitude. This region of increasing temperature is a temperature inversion; above and below this region the air exhibits its normal lapse rate of 0.65°C per 100 m elevation. 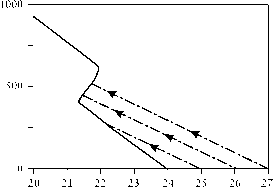 If the sun shines and the earth's surface is heated, the resulting ground-level heated air rises as shown by the broken lines in Figure 3-20. Three parcels of air are shown, one heated to 25°C, the second to 26°C, and the third to 27°C. 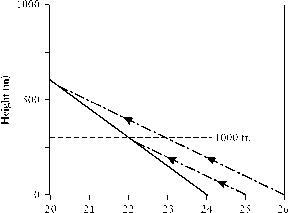 The parcel of air heated to 25°C rises to the same altitude, just below 300 m, like the similar parcel in Figure 3-19; this happens because the temperature inversion occurs above this altitude and can affect only air that is attempting to rise through the inversion. Both the 26°C and the 27°C parcels of air are trapped by the inversion; each reaches an altitude at which its temperature equals that of the air already present within the temperature inversion zone. The 26°C parcel of air rises to less than 500 m, considerably lower than the 600 m it would ordinarily reach (Figure 3-19). These temperature inversions that trap rising air are naturally occurring phenomena that may have two different causes. That is, they are of two different types, radiation inversions and subsidence inversions, explained in the following paragraphs. London tends to have radiation inversions in the winter; one of these trapped a highly polluted fog in 1952, producing the notorious London killer fog, which was considered responsible for over 3000 deaths. Los Angeles tends to have subsidence inversions that trap pollutants in the summer and fall. FIGURE 3-21 Mechanism by which a subsidence inversion occurs. Original which air ceased subsiding. environment >v with normal lapse rate. N.
A radiation inversion generally occurs at night, when air near the ground is cooled by conduction from the cooled surface, especially on a clear night when radiation cooling occurs. Higher up in the troposphere, the air is not cooled appreciably, so, in the absence of winds, there is colder air underneath warmer air, an inversion by definition. A subsidence inversion occurs in a region where high altitude air is pushed down nearer the ground because of topographical features in the path of prevailing winds or weather systems. This air is being pushed to regions of higher pressure and therefore is being compressed adiabatically. The same equation that held for rising air also holds for this descending air, but now P2 > P1 and T2 > T1; that is, the air warms up as it nears the ground. Figure 3-21 shows how this subsiding air creates an inversion; again horizontal winds must be absent for the inversion to be reasonably stable. The two mechanisms for forming an inversion have exactly the same results, trapping of heated air and any pollutants that may be present. In this chapter, we have considered the climate history of the earth, the Milankovitch theory of the ice ages, the other factors that affect the earth's climate, the peculiarities of urban climate, and the formation and consequences of temperature inversions. It should now be possible to consider all the questions asked at the beginning of Chapter 2.